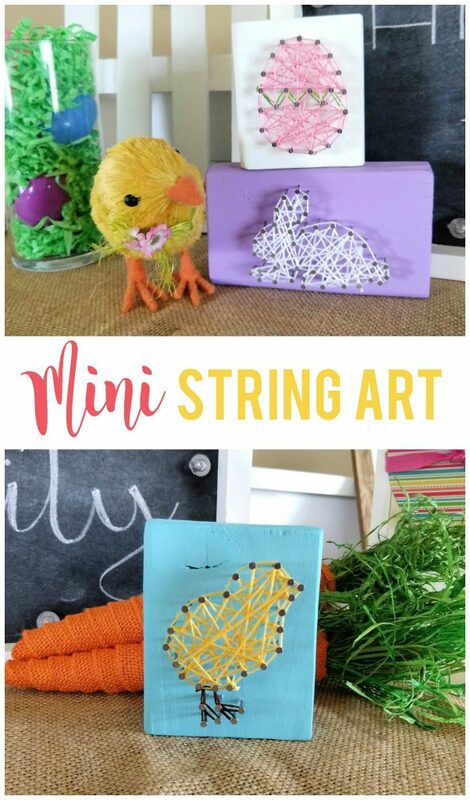 Mini string art is a fun way to add style and dimension to your decorations, plus you can make them to fit any season or holiday! Spring is finally here and I couldn’t be more ready! I recently packed away our St. Patrick’s Day decorations and replaced them with Spring and Easter decor. 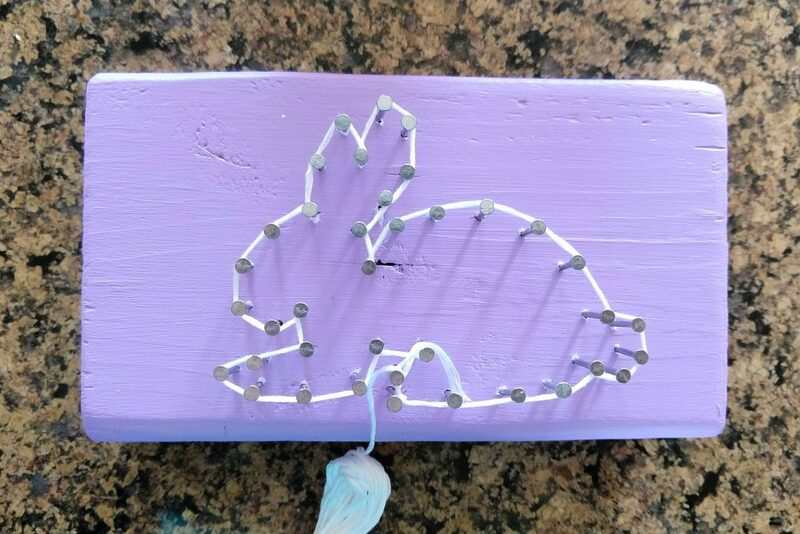 I felt like my decorations were needing a bit of an update so I decided to make some mini Spring string art in pastel colors! 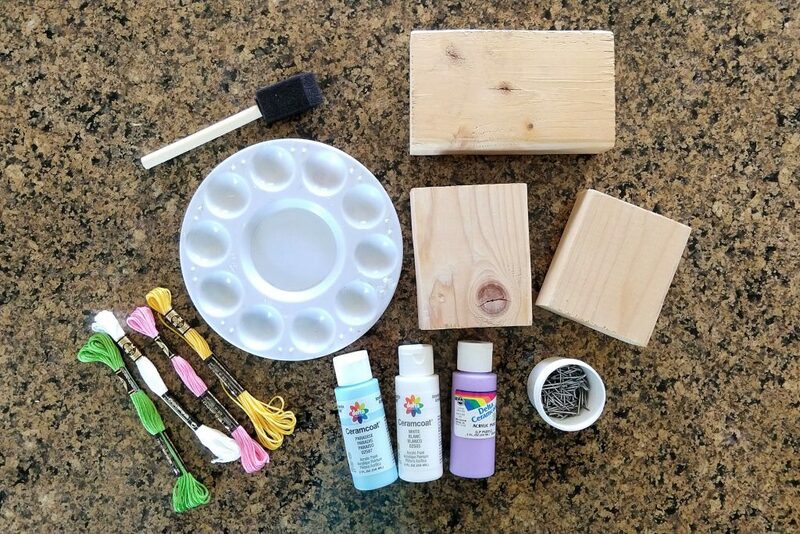 I use a lot of the same tips and techniques I share in my rainbow string art tutorial from a couple of years ago, but this project is a little bit simpler because it doesn’t require as many colors. First, you’ll need to cut your wood to the size you want. I already had these scrap pieces of wood from a previous project. Next, you’ll want to sand each piece down so there aren’t any rough edges. I used a piece of 80 grit sand paper wrapped around a sanding block to help me grip it better. Wipe the wood off on the grass or with a slightly damp cloth to remove the extra dust. 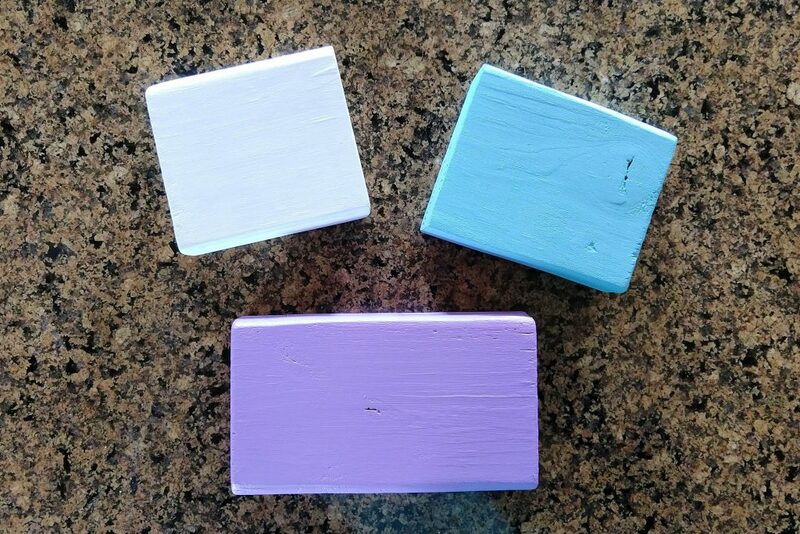 After the wood has been sanded and wiped down, choose the colors you want to use to paint the blocks. I used white, light purple and light blue to contrast with the colors of the embroidery floss I wanted for each silhouette. I recommend using foam brushes and doing a couple of coats to make sure the wood is completely covered. While the paint is drying, find the images you want to use. 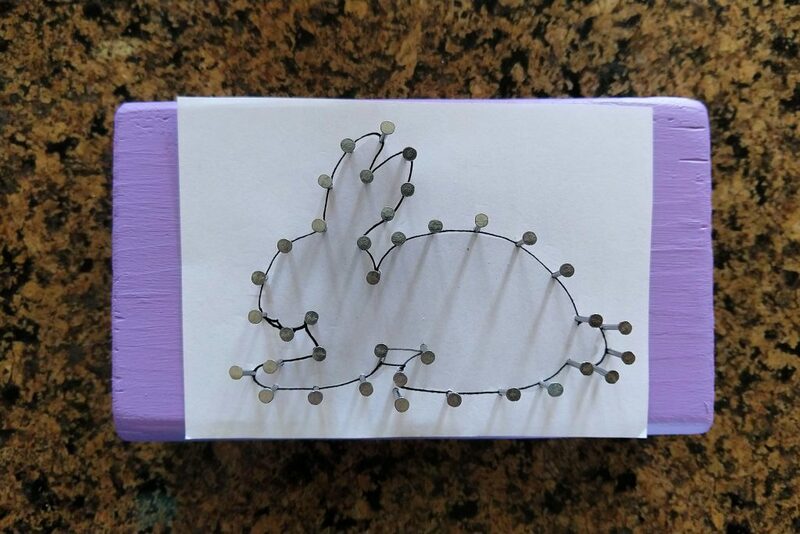 I chose a bunny, a chick and an egg since this is part of my Spring decor, but just like my mini pallet board decorations, you could easily choose any shape to fit any season or holiday. To find the shape, I searched on Google for free images, saved them, opened them in a Word document and resized them to fit the wood. Before I printed them off, I changed the color of the image to a very light gray to save on black ink. 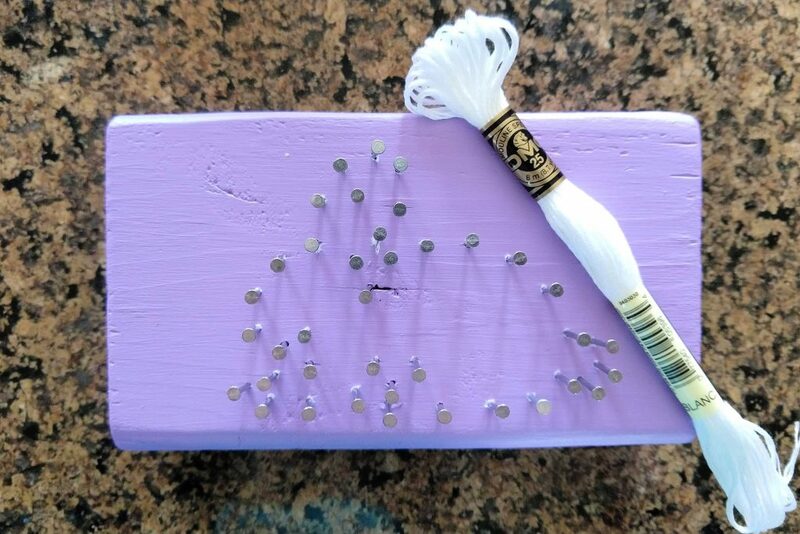 **TIP** When doing string art, less detailed silhouettes are better because when you space the nails out, you need to still be able to tell what the shape is. Once printed, trace the outline of the shape with a thin black marker. (I made a couple of adjustments to the shapes to make them a little smoother.) Then I centered the paper on my wood blocks. To keep the paper from moving, I hammer one nail in where I plan on starting and then continue hammering nails in, about 1/2 inch apart, following the silhouette on the paper. Also, try to hammer the nails in the same depth all the way around. **TIP** Always hammer a nail in on corners and the top of a curve. This will help you keep the shape of the silhouette you’ll be stringing. 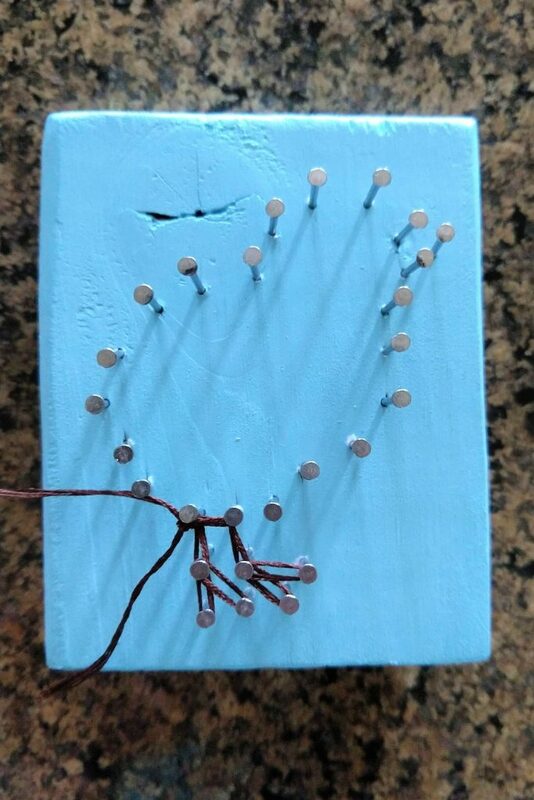 After all the nails are in, lift or tear the paper off the nails. (I like to try and get it off all in once piece so I can refer to it as I’m stringing the shape.) Get your first color of embroidery floss and tie it in a knot on the nail where you want to start. Then, start wrapping the floss around each nail, going all the way around the shape so you can see the silhouette. At this point, you can start stringing the floss across the open space in the middle. When you’ve wrapped it to the point where you like how it looks, knot the end around a nail. Often, I’ll try to tie it to the same one I started at, but that’s totally a preference. Trim the ends. **TIP** Remember to wrap the floss around the nail before stringing it across to the next one. If you don’t, the string could pop off and you’ll have to start over. Two of the three blocks I did used two colors of embroidery floss. If you want to do this too, I recommend deciding which color you want on top. For example, when I did the chick, I wanted the brown floss I used for the legs and feet to be underneath the yellow floss I used for the chick. I thought it would look funny if it was done the opposite way. Having all the supplies on hand, this was a quick and easy project that only took me about an hour for all three blocks. But the supplies aren’t very expensive at all, which means you could make a lot of these and give them out as gifts or make some for every season or holiday. This would also make for a fun craft night or weekend project. If you want to do something a little more advanced, be sure to check out my rainbow string art tutorial! 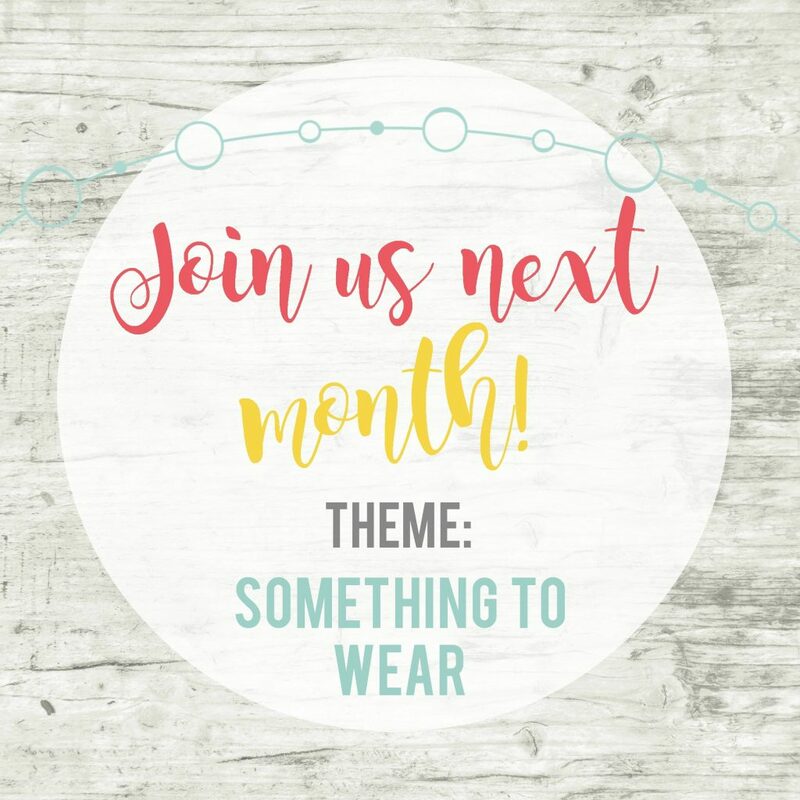 This post is part of the Inspire My Creativity link party that I co-host with 17 other lovely ladies! Our theme this month is PASTELS which is perfect for Spring and Easter. 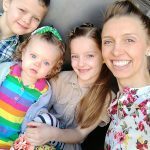 Be sure to check out the posts below and feel free to add your own pastel inspired post! 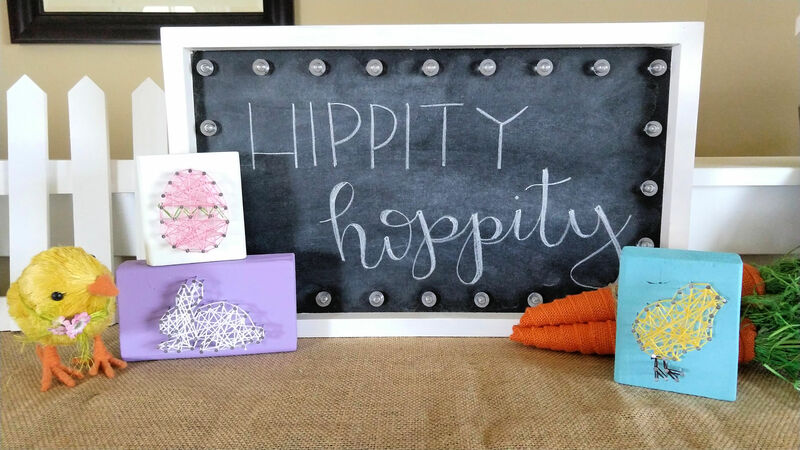 omg this is the cutest Easter DIY ever! How cute is this! My oldest two would LOVE it….might have to make them this weekend! This craft looks like so much fun! Your instructions are so easy to follow. 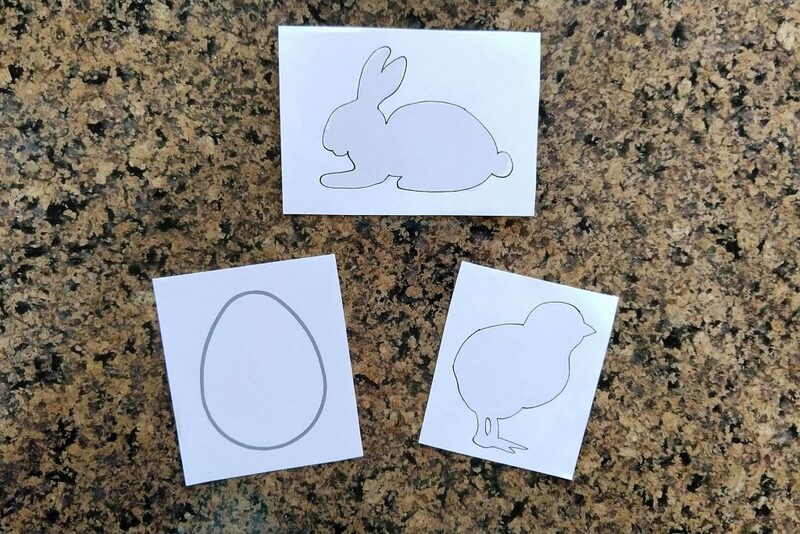 I may have to try making these before Easter with my kids. These are so cute! I love how you have it displayed with the chalkboard! 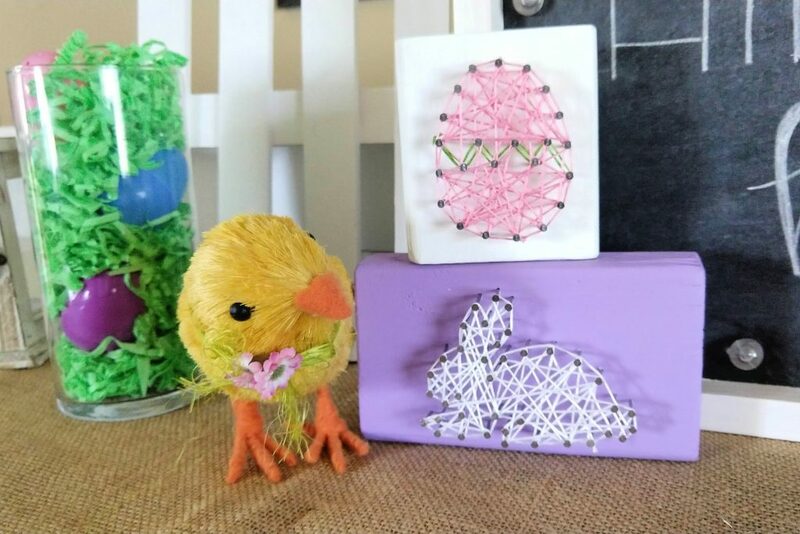 These are great crafts for Easter. I love string art. Will definitely have to give this one a try!! Oh my goodness, this is such a simple and cute craft idea! My kids would love to make these! These are so cute. I have been wanting to try string art for a while now!! Adorable! 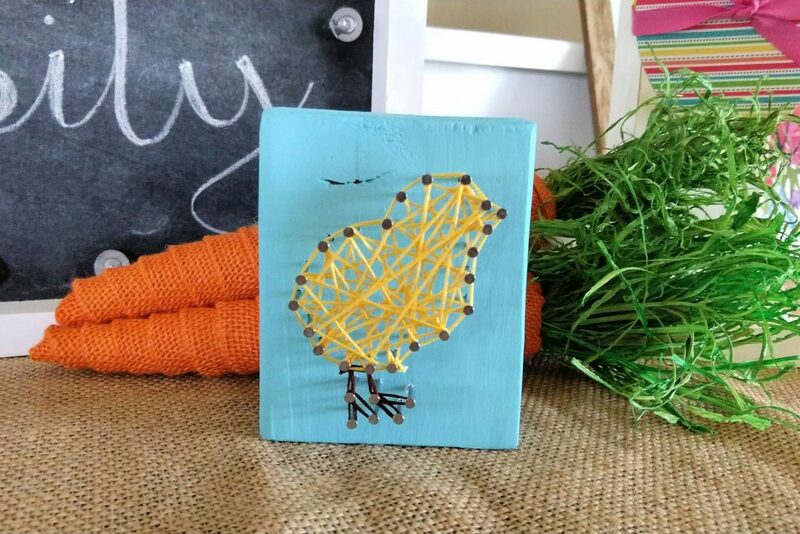 I really like the mini string art its the perfect pop of color and dimension. These are so darn cute!! I love the chick. Pinning for later. This is adorable! 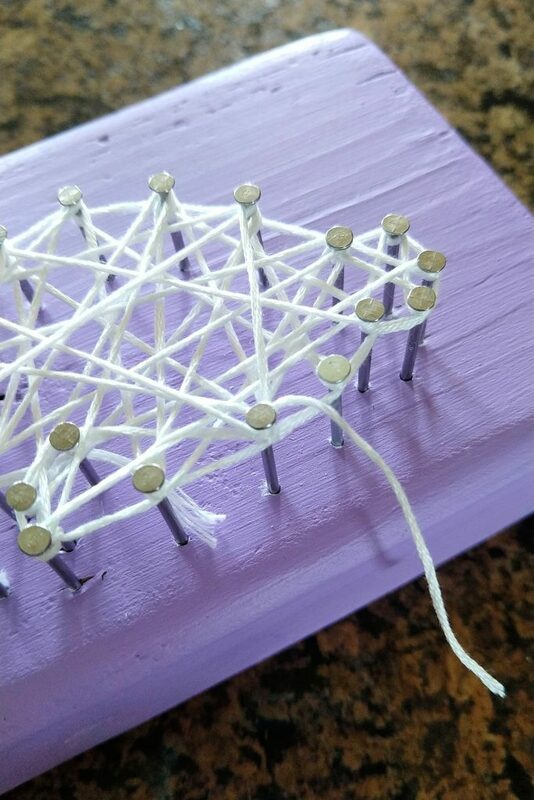 I’ve actually never tried string art! It looks like so much fun! These are so darling! I love the colors you used! I have always been fond of string art, though I haven’t tried any myself – it’s a little intimidating. Cute little trio you have created.